Which recipes have you tried? I found it rather boring when I flicked through it for the first time. Oh sorry you don't like it Fiamma. I feel responsible for having gone on about it so much!! Fiamma, your post has made me wonder why I do get on so well with this book and I think that it is because the recipes go down so well with my family. Today I made the white bean and tempeh patties and they are just simple tasty little things that toddlers can get into. I was thinking too that you hate the 'mock duck' etc.. and maybe the seitan is off putting for you in that case being so meatish. There's a recipe to make your own seitan which I have found really interesting and she also uses tempeh a lot. I have just sent off for a tempeh starter kit. Before this I didn't really know what to do with tempeh and found it pretty odd stuff but now I like it. We are also consuming a lot more tofu in different ways. I have had success with her waffles and pancakes too. The author is from Brooklyn and I have a soft spot for it although I've never been. My copy took over a month to arrive and I received it at the same time as the cupcake one which I have used less. Hoping for more time to experiment soon. For those who have this cookbook, are the recipes high-fat? Do they use a lot of oil? I'm not anti-fat or anything but I'd rather not have to use tons of it. Isa is not really keen on keeping things lo-fat, but states in the baking section that all the recipes can be turned into low-fat ones. Among the regular recipes, there are quite a lot of Mediterranean and Asian recipes which don't require a lot of fat. Fiamma, give it a try! I had the book on my shelf for some weeks before I tried something (I think it was the Gnocci recipe)- and immediately fell in love. I did the Samosas last week and they were absolutely wonderful; my omnivores couldn't get enough of them! Onions softened in a little water instead of oil aren't too bad. I did the carrot bisque last night - it was absolutely fantastic! I'm a new cook and this book has been absolutely wonderful. I let it sit around for 6 months, but now that I'm using it, I'm hooked! I was in Waterstones in Canterbury a few months back and found this book amongst the veggie cook books. Personally I love it and think everyone should buy it, I mean afterall it taught me to make vegan pancakes that even my omni friends like so it can't be bad ay? same for me, I tried about a billion vegan pancake recipes before buying the book and the VWAV one was the first to work for me (same for the pizza dough). I don't like this cookbook either. Aw. I love this cookbook. I make Punk Rock Chickpea Gravy almost every weekend, I make a double or triple batch and just... well, put it on stuff all week long. I don't like mock meats much either, so I just ignore those recipes. All of the baked goods have gone over well with everyone at potlucks and office parties, with veggie people and omnis. You either love it or hate it.....or so the story goes! I have just sent off for a tempeh starter kit. Wow, there is a tempeh starter kit? Where can I get one? Yeh I have no idea what to do with Tempeh....a starter kit would be awesome! This is where I got my free sample kit. I made the lemon gem cupcakes today. The icing was runny. The cupcakes had to be refrigerated for a few hours after to get it to set. Does anybody have any idea what's up with the runny icing? Aw. I love this cookbook. I make Punk Rock Chickpea Gravy almost every weekend, I make a double or triple batch and just... well, put it on stuff all week long. What kind of stuff do you put it on? I love chickpeas and I love gravy, so it seems logical I would love this recipe. But I can't eat potatoes (they're an arthritis trigger for me) and I can't think of what else I might put it on. I think it'd go well with all sorts of grains, preferably brown rice. I bought this book yesterday - although I'm mainly raw these days, certainly on week days, I like to cook when we have guests and also at the weekends for myself and Corum. I think the recipes look great - it is only the 3rd vegan cookbook I have, I usually veganise vegetarian recipes. Some of the ingredients are not familiar to me and a few Americanisms I don't understand! I'm doing the bean and roasted garlic soup for Corum tomorrow. There are also some close-to-raw recipes, Hemlock- I strongly recommend making the Mango Summer rolls (only the noodles need to be cooked/soaked in hot water)! I made the chickpea gravy today (I also made a huge mess.) I put some over brown rice and veggies and was pretty happy with it. I like the Chicago Diner Cookbook's gravy recipe better, but I'm sure the chickpea gravy is way better for me. Sorry, I've been away. Mostly I put Punk Rock Chickpea Gravy on brown rice, but it's also really good over cooked greens such as kale, chard, or cabbage. Yesterday I tried it over brown rice and veggies. It was pretty good. I've just borrowed this from the library but didn't like the 'feel' of any of the recipes . I found the dialogue a bit sort of 'young' aswell . To be fair I rarely use recipes, i just get loose ideas from books . Then it's a very good book, there are so many recipes that I tweaked quite a lot and use for everything. Ok I really should stop defending the book, right? I'm supposed to be getting this cookbook. It's going to be my first vegan cookbook. Yay! I want to get the Cupcake one too. I think that'll be nice. I got it from this vegan website HerbivoreClothing.com. I got a pink Koala shirt too. It's so cute. Gals, the countdown is on for the next book...amazon tells me it'll be out by the end of October. Ooo ooo what's it called? Oh Wow! I'm going to get this book ASAP. I only have one vegan cookbook called "Tofu Quick and Easy" by Louise Hagler. Unfortunately, I didn't realized that it was a low-fat, low-salt tofu book. No wonder there's no taste in the recipes I use in that book. Vegan With a Vengeance here I come. Here are some of my favourites from the book. 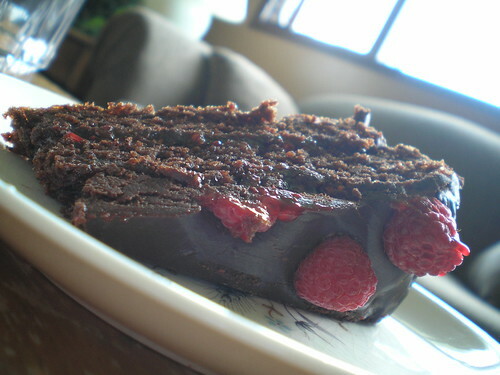 Raspberry Blackout Cake. Best cake EVER. I've been told by several omnivores that this is the best cake they have ever had. 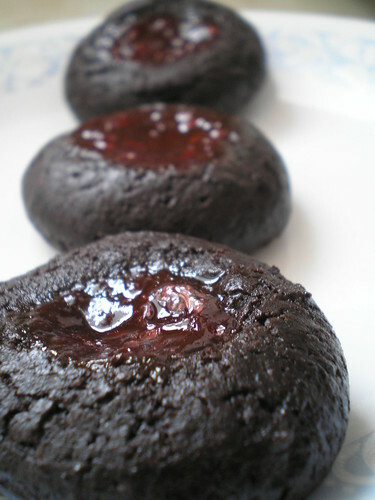 It always amazes my that the thumbprint cookies come out just like my grandma did them! Someone mentioned that the muffins didn't come out right but I haven't had any problems. The Fauxstess Cupcakes are worth the work!!! Non-vegans really like these! They really aren't that hard. I skip the squigglies because I tried those and failed! They don't need them anyway, they are just decoration. I haven't used this book for ages now. I really enjoyed making some of the recipes but i dont use any in my everyday cooking. I still think the carrot cake is the best cake ever though. I just got this book yesterday. I know...I can't believe that I have been vegan for over a year and did not own a copy of this book either. But last night my boyfriend and I had veggie burgers and i made the sweet potato fries, and this morning I made the best scrambled tofu I have ever tasted with recipes from this book. I really look forward to making several things I have seen while poring over it. Any suggestions?